Most high-speed, high-bandwidth networks consist of fiber optic cable that is permanently installed in protective walls, ceilings and flooring, or buried underground in thick, waterproof conduits. But building the world’s fastest and most powerful temporary network from the ground up each year for the SC conference necessitates a different approach. In the days leading up to SC17, more than 180 volunteers will gather in Denver to set up SCinet, the high-capacity network that supports the revolutionary applications and experiments that are a hallmark of the SC conference. SCinet takes one year to plan, and those efforts culminate in a month-long period of staging, setup and operation of the network during the conference. 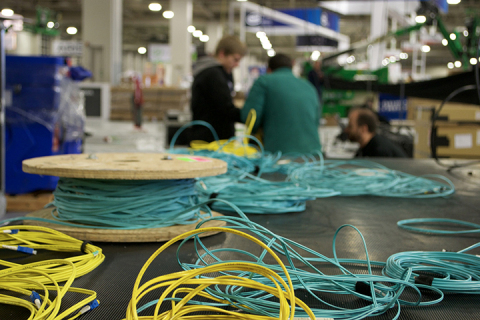 Miles of fiber will be temporarily taped to the cement floors and hung from the rafters of the Colorado Convention Center. Although carpet and rigid masonite will cover the fiber on the ground, it first will be exposed to the traffic of dozens of exhibitor carts, forklifts and other utility vehicles that pass nearby and sometimes over it via temporary thresholds as exhibits are constructed on the show floor. Rebecca Hutchinson and Annette Kitajima are SCinet volunteers who co-chair the fiber team. Hutchinson said the need for on-site fiber repairs on the ground at SC varies greatly from year to year. The fiber team uses fusion splicing (using heat to fuse the ends of two optical fibers), section replacement and hand termination to repair connections as quickly as possible, so disruptions are minimal. When the conference closes on November 17, all of that fiber will be removed in less than 24 hours. “Even if the fiber makes it through an SC unscathed, re-spooling at the end of the show takes its toll, with the inherent twists and kinks that come with a speedy teardown,” Kitajima said. Members of the team will test all of the fiber during SCinet’s annual inventory meeting in the spring. Some of it will be damaged beyond repair, but most of it will be redeployed next year at SC18 in Dallas, just as most of the fiber in Denver is being reused from SC16 in Salt Lake City. This is part of SCinet’s sustainability strategy – recovering, refurbishing and reusing available resources whenever possible. Brad Miller and Jerry Beck of the Utah Education and Telehealth Network are fiber experts and SCinet volunteers who spent additional time during the summer and fall testing and repairing a batch of used fiber from past SCs. Miller said that of the 84 reels the duo has tested, 24 have been refurbished. That amounts to 28 percent or 1.28 miles. Beck starts the refurbishing process with an EXFO OTDR, or Optical Time Domain Reflectometer, to determine how well a given reel of used fiber will transmit light. The reflectometer measures the speed of light as it passes through the fiber to identify flaws and pinpoint “pretty much exactly where problems will be.” In most cases, replacing the ends of the cable resolves the issue. To attach new connectors he uses a Swift F1 cable splicer. It expertly strips protective insulation and exposes fiber thinner than human hair, and then aligns, fuses and reinsulates it. “Sometimes you can be doing splicing with this machine and a hair will fall into the splice area and it will indicate that it’s a fiber and will say your fiber isn’t clean,” Beck said. “All these fibers are measured in microns. It takes the actual fiber cores and lines them up so close that it tells me that the clad is three microns or three millionths of an inch.” Beck said the work does involve an element of danger: Tiny unshielded fiber fragments can easily pierce fingers and are particularly painful if accidentally rubbed into an eye.